Mission: Environment Canada's Greenhouse Gas Measurement Program operates a network of stations to accurately measure atmospheric concentrations of greenhouse gases from coastal, interior, and arctic regions of Canada. The data collected at these stations is used to identify trends, seasonal variability, and spatial distribution of greenhouse gases in Canada; provide a coherent and consistent picture of the present and past states of greenhouse gases in the atmosphere; and to provide the scientific and policy-making communities with high-quality baseline and trend information. 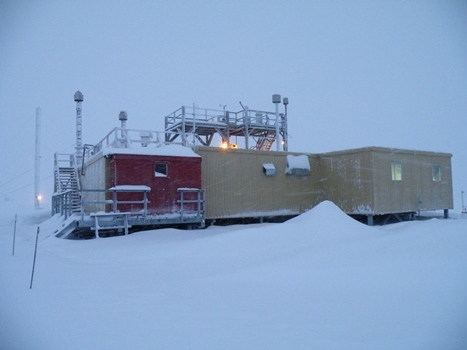 Facility and Environs: In 1986, the Dr. Neil Trivett Global Atmospheric Watch Observatory was opened as Canada's first research station for the continuous monitoring of background concentrations of trace gases and aerosols. The Alert GAW Observatory is approximately 400 m^2 in size and is situated 210 m above sea level and 6 km SSW of CFS Alert. It is located on the northeastern tip of Ellesmere Island in Nunavut, Canada at 82º28'N and 62º30'W.